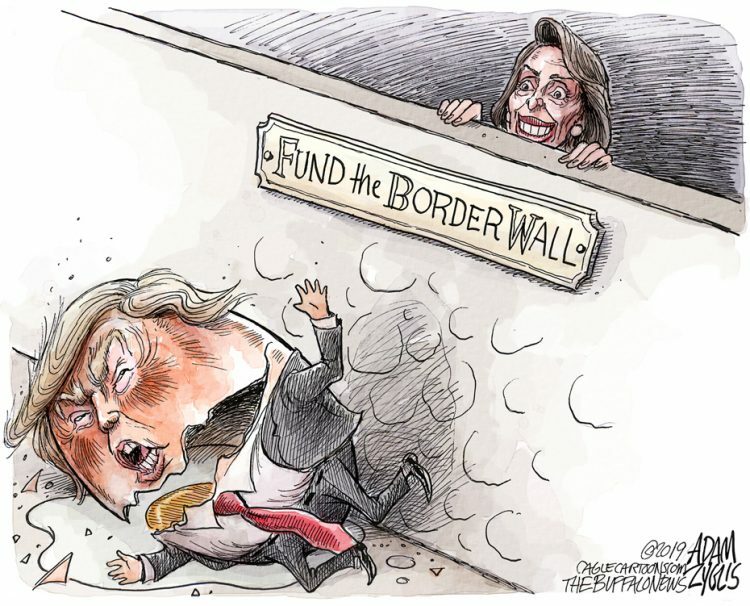 Quote of the week, From the New York Times: Bret Stephens nails it: “Instead of building a wall that Mexicans will pay for, Americans are going unpaid for a wall that’s not going to be built…” (NYT) Thank God the shutdown is over, for now. Here’s some local news about OYSTERS from the Lost Coast Outpost that you’ve probably seen but need to be reminded of. It’s about OYSTERS! Read it HERE. Also in local news, you all know that the Angel of Death visited Eureka last weekend and anyone who ever knew J Hockaday and Tony Smithers is sad. Further in local news,the Times – Standard carries about the fifteen annual notice that KEET is on the verge of foundering. When I first moved back here, in ’93, I dutifully joined KEET but somehow over the years I dropped my membership and stopped watching! The only thing I watch on KEET these days is an occasional Frontline. I believe there should be a PBS but I think a lot of other people have abandoned them in favor of cable. Here’s a reminder of the cluelessness if not heartlessness of Trump’s 81-year old probably senile billionaire Commerce Secretary, Willbur Ross, who frequently falls asleep during meetings.. You’re not still patronizing Carl’s Junior, are you??? Read it HERE. MORE FOOD STUFF: GREAT piece about FISH you will want to read. It’s HERE. The ICHIBAN Revisited: We dropped in last week for dinner and had a mixed experience. The food was good, the service was pretty raggedy. The place was about half full and the ambiance, as usual was quiet and pleasant. We ordered two sushi’s (is that grammatical? ), and two bento dinners, which included soup. After quite a while, the server brought ONE sushi (the unagi) and two lukewarm soups. We didn’t bother to send the soup back because we figured we were about to get the other sushi momentarily. Wrong! We waited another fifteen minutes during which the five staff members we had counted, chose to absent themselves. We were seated near the front desk and the phone kept ringing and ringing with no one answering it. Finally the server returned with the OTHER sushi (California roll) and our bentos all at once. I would have preferred the sushis first, THEN the bentos, but I’m getting to be an old grinch. The food WAS good. He had the chicken katsu and I had the “Golden Fish” which was perfectly fried and heated up well. Generous portions. Definitely worth a return trip. No website. THE KABOB CAFE´ REVISITED, TOO: The last time we had tried them I was terribly disappointed with the gyros meat, which was full of GRISTLE! I HATE gristle! I am happy to report that they dumped their bad supplier or whatever the problem was and the gyros has returned to its former Olympian heights of excellence. The Kabob really is a gem. Visit them soon in Valley West. Website is HERE.